The Hotel Nani Mocenigo Palace is a stunning new four-star hotel in Dorsoduro, across a canal from the San Trovaso Church (see photo above). As the name implies, it's housed in a restored palazzo, and the hotel's lush decor is reminiscent of the Venetian Republic's heyday. Unlike many of its four-star peers, the Nani Mocenigo Palace is pet-friendly. It's also a good choice for upmarket families, thanks to a number of rooms and suites that can accommodate three or four guests. Other hotel facilities include spacious public rooms, a garden, and a café-bar in the lobby. Take the Alilaguna Linea Blu (Blue Line) airport boat to the Zattere stop, which is a few minutes beyond San Marco. As you leave the floating pier at Zattere, turn left and walk along the water until you reach a stone bridge. Do not cross the bridge. 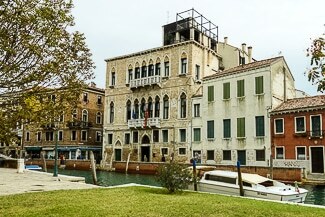 Instead, turn right onto the Fondamenta Nani and walk along the canal. Continue walking a minute or two to the hotel. Leave the terminal by the main doors, which are at the end of the building. Cross the small wooden bridge. Walk straight ahead along the Giudecca Canal until you reach another bridge. Cross the bridge and turn left onto the Fondamenta Nani.